With the Holidays around the corner I have been trying out recipes to put on my goodie trays. I love the flavor of mint around the holidays, especially when paired with chocolate. With those two flavors in my mind I decided to bake up some goodies. 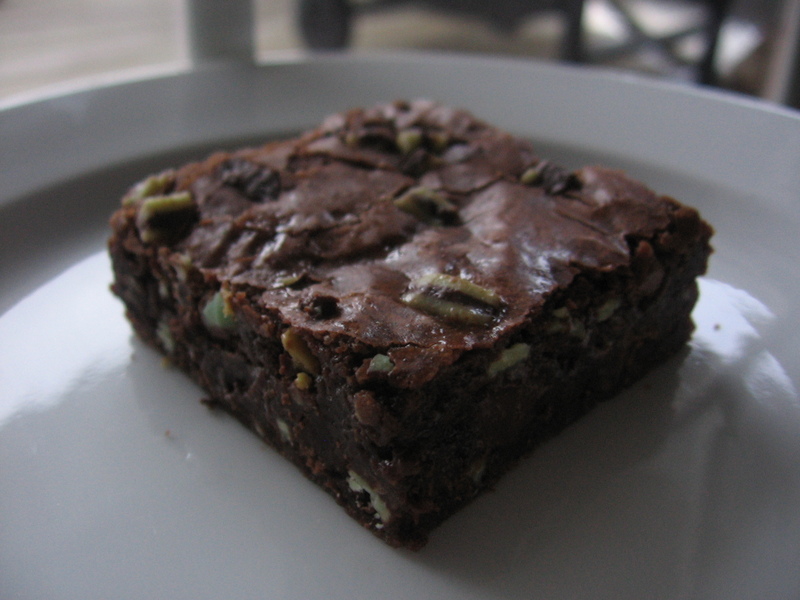 What better Holiday treat than Mint Brownies? I made up this recipe as I went along but based it off of these. These brownies are wonderful and exactly what I was trying to create. The texture of these fall somewhere between a ‘cakey’ and ‘fudgy’ but lean a little more toward the fudgy side. In my opinion they have the perfect texture. 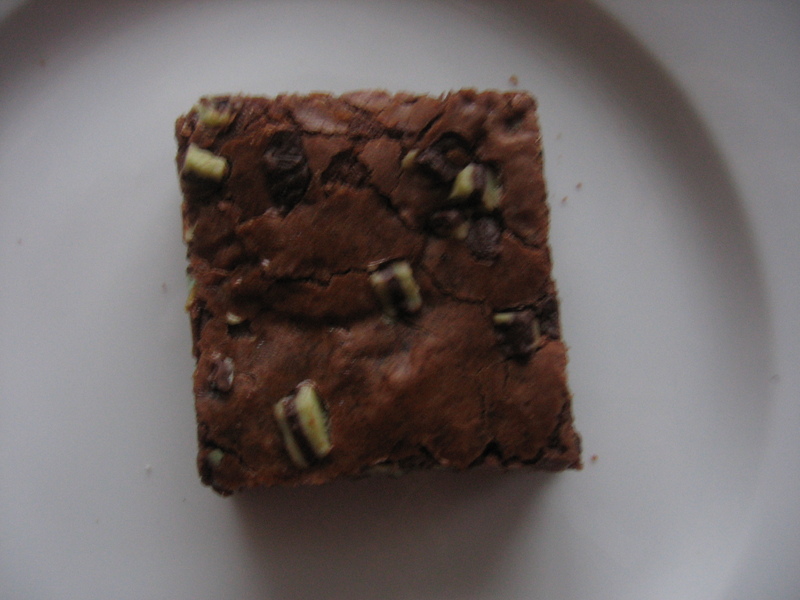 The brownies themselves have a wonderful minty flavor that is is not too overpowering but rather enhanced by the peices of Andes mints spekled through out each bite. The light green color of the mints will make these perfect for the holidays. I love how festive they look and will round out my holiday goody tray perfectly! If you are looking for a rich chocolatey brownie that will compliment a cup of hot cocoa on a chily night, these are for you. Next time I think I will bake in mini muffin tins drizzle with melted white chocolate tinted with green food coloring for a little more pizzaz. I can’t wait to try these again!. In a heat-proof bowl, melt together butter and chcolate in the microwave in 30 second intervals stirring after each interval until smooth. Allow to cool for 5 mintues. In a large bowl, whisk together flour, baking powder, and salt in a medium bowl; set aside. Whisk or beat the sugar into the chocolate mixture. Add eggs and mint extract mixing until combined and smooth. Add flour mixture and mix until combined. Gently fold in the 3/4 cup Andes chips. Carefully pour batter to prepared pan, and smooth top with an offset spatula. Evenly sprinkle remaining Andes chips over top of the brownies. Bake for 25-20 mintues or until a cake tester comes out with a few crumbs. This entry was posted in Brownies, Rated a 9 by bakingblonde. Bookmark the permalink. Oh wow. I cannot wait to try these! And I hope I can find Andes chips, or mint chocole chips!! Otherwise I’ll be doing a lot of chopping! While these sound absolutely fantastic and I wish I could try them, I wouldn’t be able to eat them…because I’m allergice to peppermint. :-S But these do sound tasty! Oh man, I love mint and chocolate (and brownies)! These look wicked good. My grandmother used to make a mint, chocolate and coconut cookie that was just amazing. I’ll have to get my hands on that recipe and see if I still like them as much as I did when I was little. Those cookies sound amazing! You must find the recipe and make and blog about them!! Yum! I’ve done brownies before and just sprinkled the Andes chips on the top while the brownies are still hot, then when they melt, within minutes, spread it all over the top, then cool to harden. Yum! You could do that for your mini tops, too. These look great! I will definitely be making these this month! WHOA! Holy deliciousness!!! I’m all about these guys! Ok, I need to leave work so I can make these NOW! They look SUPER good! Yum! This is definitely the season for fudge – looks delicious! Mmmm, I THOUGHT I already had my Christmas baking list finalized – but these could make their way on to it! These look amazing! Chocolate and mint is such an awesome combo. Oooh these sound phenomenal! Can’t wait to try them. I also love the mint/chocolate combination around the holidays! Thanks for sharing your recipe! These look realllllly good! And the texture you described is just the way I like ’em! I can’t wait to try ’em though I’m going to do as you suggested and make ’em as minis w/the white chocolate drizzle. Question, can brownies be frozen? If so would you defrost ’em in the fridge or on the counter? I know not to frost ’em. Also, how do you make so many “treats” and so many varieties and have them still be “fresh” for when you are ready to “deliver”? Thanks for your help! I would highly recommend making these!! You can freeze brownies. I do so after baking (and they are completely cool) and seel in a Ziplock freezer bag and then place in the freezer. I would defrost on the counter, and store in a sealed container after thawing. I make about 6-7 different varieties of treates to put on my trays. I like to vary the type (cookies, browines, candy) along with different flavors (mint, chocolate, fudge, peanut butter, etc). I usually bake everything over the weekend, assemble trays Monday night and seal them in trays with lids. I deliver the trays through out the week. That way the treats are all fresh! Right now I am ‘testing’ the recipes I will be making for the trays!! Brownies + mint = Delicious!!! I will definitely have to try these. YUM! I wonder what it is about mint and chocolate that make it so wintery. Thanks so much for the info! I’ve done my trays but decided to make these all for one family that loves chocolate and mint. Here’s my problem. I’ve wasted two bags of white chocolate trying to melt it to a pourable consistancy so I can drizzle it over these brownies. HELP! I haven’t tried a brownie yet but they smell amazing! White chocolate can be very tricky to melt. I do so in a double boiler (or a make shift one with a glass bowl over simmering water). I add a TBS or two of crisco or melt some Parifin Wax with it to keep it thin and not clump. I melt low and slow, stirring until smooth, then I drizzle with a fork or in a squirt bottle. Thanks! I’m so glad you were able to respond. I’m off to try your tips. Hope they work for me otherwise the brownies are going drizzle free! LOL!